Carolyn Gage and I live on a small island in Maine, in Southwest Harbor. My favorite guilty pleasure is Playing hooky from work by going hiking. I toured in a one-woman show about a lesbian Joan of Arc for twenty-two years, so I would have to say Joan is my favorite superhero, dead or alive . Often my favorite book is the one I am currently reading… and right now that would be Jane Crow: The Life of Pauli Murray. It’s the biography of an amazing African American woman who identified as male in an era before transgendered identities were medically accepted. Against all odds, she persisted in a quest for racial justice and the truth about her identity. A friend of Eleanor Roosevelt’s and other movers and shakers in the early years of the civil rights movement, Pauli hitchhiked and rode the rails cross-country in 1937, passing as a male, with her white girlfriend. Mind. Blown. My contribution to Queerly Loving is actually a short play, Planchette. Here’s the official one-line synopsis: “During a nor’easter on the New Hampshire coast, in 1879, two fourteen-year-olds share their secrets about trauma they have survived and the deeper secrets about their sexual orientations and gender identities.” One of the kids, Mollie, is a girl who is struggling with the knowledge that she is only attracted to other females. The other, Jude, is either a transgender boy or a lesbian butch. (In 1879, either identity would have been completely censored.) Both are struggling for a place in a patriarchal world. I was inspired by a scrap of memoir I discovered in the Maine Women Writers Collection at the University of New England. It was written by a woman who lived on the Isles of Shoals as a child and who was friends with two women who lived on a neighboring island. Both of these women were horrifically attacked by an ax murderer one night in a crime that has become part of New England lore: The Smuttynose Murders. This memoir indicates that the women were in a lesbian relationship, and that, possibly, their lesbianism had motivated the murderer. I wanted to explore how that murder and that knowledge might have affected a sensitive girl who knew the victims. Then I became intrigued with pairing Mollie with a trans or butch kid, with her own history of trauma, coming from the frontier in Denver, where social norms were far more fluid. Finally, I brought them together around the parlor game, “planchette,” which was an early form of the Ouija board. This is the device I chose for exploring what cannot be spoken. The play won the People’s Choice award at the Maine Playwrights Festival, and it was selected for inclusion in the Fresh Fruit Festival, New York City’s queer fringe festival. It was very gratifying for me to have created a play that offered an opportunity for queer kids to put their stories on the stage. 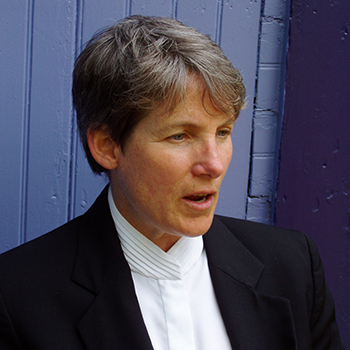 Carolyn Gage is a lesbian feminist playwright, performer, director, and activist. The author of nine books on lesbian theatre and seventy-five plays, musicals, and one-woman shows, she specializes in non-traditional roles for women, especially those reclaiming famous lesbians whose stories have been distorted or erased from history. Carolyn is online at www.carolyngage.com.